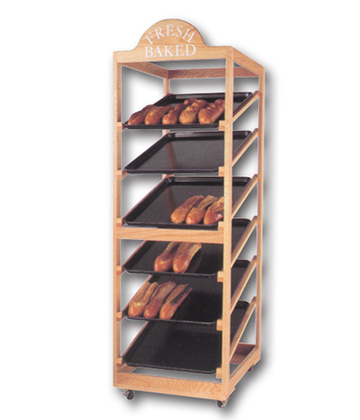 This Oak Baking Tray Display goes from the oven to the display. Has 9 angled shelves to accommodate 20" x 27" bakery trays. Has built-in header to customize with your company branding or engraving. Additional cost for custom imprinting. See Page 51 of our 2011 catalog for details. Price shown is subject to change. This product was added to our catalog on Monday 31 August, 2015.